The practice of organizations and private citizens growing their own forests is taking root around the world. Forests deliver vital environmental services. They help in keeping the air and water clean, conserving biodiversity, and neutralizing the effects of climate change. Most of us are aware of the negative effects of deforestation and the fact that it is a major global concern in today’s world. However, here is some good news to cheer about. According to a 2015 report by the UN FAO, the net global deforestation rate over the past 25 years has decreased by more than 50%. In their latest report, the FAO has even mentioned that it is possible to have a future with zero net global deforestation. In this article, we examine how individuals can contribute to this positive change with the help of companies like Afforestt that help individuals and organizations to create wild, native forests in the backyards of their homes or offices or elsewhere. When thinking of forests, our mind’s eye often wanders through the dense rainforests of the Amazon or the mangrove forests of the Sunderbans or any such area hosting fierce wild animals like the anacondas, the tiger or the lion. However, by definition, a forest is any large tract of land covered by trees and undergrowth. The presence of forests attracts the local fauna to take seek refuge in the safety of vegetation cover. Forests can be created anywhere as long as there is the availability of land and sufficient resources to support plant growth on the land. Although the bulk of the world’s forests are natural, planted forests are becoming increasingly popular. Such forests account for about 7% of the total forest area in the world. The area covered by planted forests is also growing quickly and has increased by more than 110 million hectares since 1990. While most forests are publicly owned, the number of individual and community-owned forests is also rapidly rising. With rising concerns about environmental degradation and its detrimental effects on human health, many individuals and organizations today believe that having a forest near their home or office is an ideal way to ensure a steady supply of fresh air. Such green patches also enhance the aesthetics of the place and provide a source of recreation after a day’s hard work. Children learn to recognize the local flora and fauna by visiting these forests. The common belief, however, is that creating a forest on barren land is a monumental task that requires great time and effort. Although it is true to a certain extent, the presence of forest-creating companies like Afforestt makes the task appear relatively easy. To learn about how an individual can grow his/her own forest, World Atlas spoke to Shubhendu Sharma, the Director and Founder of Afforestt, a company based in Bengaluru, India. Sharma was working as an engineer for the Toyota plant at Bengaluru, India, in 2008 when he got involved in a project led by the Japanese botanist Akira Miyawaki. Using a technique developed by him, Miyawaki was working to cultivate a forest at the Toyota plant. With the help of this technique, he has managed to regenerate forests across the world. Although a typical forest takes nearly a century to mature, Miyawaki’s technique works like a wonder to generate self-sustaining, dense forests at a much-accelerated rate. Sharma was so inspired by his interaction with Miyawaki that he decided to create a small forest in his parents’ house in Uttarakhand, India. The project was a success and now with further motivation, he decided to quit his job and pursue the activity of forest creation full-time. In 2011, Afforestt was founded by Sharma. It is a for-profit end-to-end service provider for natural forest creation. With the aid of Afforestt, it is now possible to generate a forest in only about two years' time. Today, Afforestt has planted 400,790 trees to create 111 forests in 38 cities in nine countries. These forests have been raised at a variety of locations including villas, apartment complexes, Bengaluru airport, Chennai metro, resorts, hotels, etc. According to Sharma, the biggest challenge in creating forests is the non-availability of native trees in nurseries. 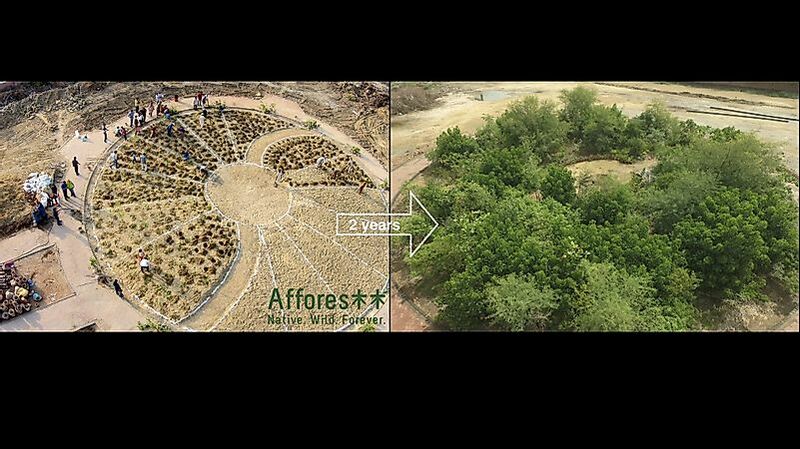 Hence, Afforestt has also set up its own seed-bank and nursery in Rajasthan, India. In the future, Sharma wishes to provide the best afforestation services in the world in partnership with other companies working in the same field. The success of enterprises like Afforestt provides evidence of the fact that people are becoming more aware of the needs of the environment. They are ready to spend money to create patches of forest in their backyards or communities. The growing industry of afforestation services thus paints a very positive picture of the future of our planet.